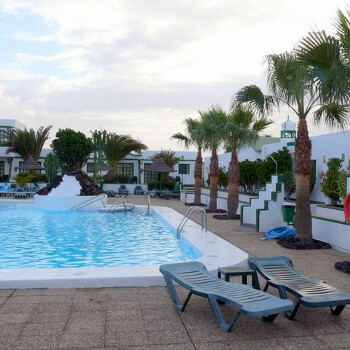 The two key Las Marinas Apartments are situated a short walk from the beach, in the Matagorda area of Puerto del Carmen, on the southern coast of Lanzarote, near to the airport. The accommodation at the two storey Las Marinas complex comprises 44 one bed apartments. these apartments are basic but a real bargain!! they are set at the top of a steep hill, no not so good for the elderly! great when you've eaten too much, so you can burn some calories off!! The hotel staff were polite and helpful and maid very cheerful. Overall the cleanliness was ok, pool cleaned everyday and sunbed area, rooms cleaned on average 2-3 times a week , we did need to ask for clean towels - but staff happy to oblige. We loved it here so much we are coming back again this year! Las Marinas Apartments in Matagorda are well-equipped and comfortable set in a largely residential part of Matagorda. Two styles of accommodation - duplex (toilet/bedroom/balcony upstairs, living area/kitchen/terrace downstairs) and bungalow style. The pool area was sufficient for the size of accommodation, with the decent-sized swimming pool. The Reception/Bar only seemed to be open during the day/early evening and at night the apartments may seem a bit remote. Approximately 10 minutes stroll to the beach area/main resort (shops, bars, restaurants); further 10 mins to Playa Pocillos and another 15 or so to the harbour area of PDC. Local bus and taxi an option. As the apartments are at the top of a steep hill, location may not suit the elderly, infirm or young children. But it may prove a good way of walking off the evenings' excesses and makes for a peaceful location. We are going back this year.